Cork Airport is expected to resume full service tomorrow, following the clearance of the wreckage of the plane which crashed yesterday morning, killing six people. The first commerical flight to land at Cork airport has arrived safely at the airport with passengers shortly after 7pm. The Ryanair flight FR9853 arrived from London Gatwick at 19:14 with passengers. Six people died when the Manx2 flight from Belfast to Cork crashed yesterday morning, overturning and catching fire on its third attempt to land. There was heavy fog in the area at the time. The five men and one woman who survived the crash spent the night at Cork University Hospital. Two of the survivors were released this lunchtime. In a statement issued on their behalf by the HSE South, Donal Walsh and Laurence Wilson and their families wish to express their condolences to the families of the deceased and to say that their thoughts and prayers are with them at this very difficult time. The six men who died have all now been named. They include passengers Pat Cullinan from Belfast, Michael Evans from Belfast, Richard Noble from Derbyshire in England, and Brendan McAleese from Ballymena, who was a cousin of the President's husband Martin. 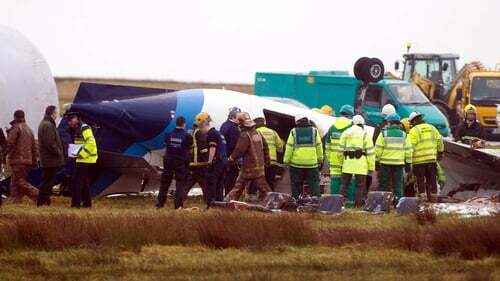 The Spanish pilot of the aircraft, Jordi Lopez, and the English co-pilot, Andrew Cantle, also died in the crash. The two men had been working for the company for a number of months. Speaking on RTÉ's Morning Ireland, Cork Airport Chief Executive Pat Keohane said he believed the quick reaction of airport emergency staff prevented further loss of life. The Cockpit Voice Recorder and Flight Data Recorder have been located and removed from the scene. They will be taken to Dublin where specialist equipment will be used to download the material in them. 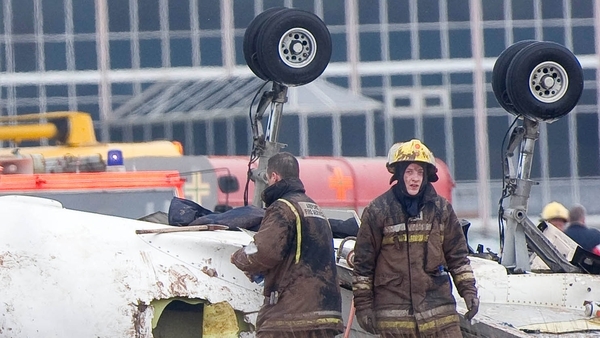 The investigation into the cause of the crash will involve experts from Ireland, Britain, Spain and the US. The National Transportation Safety Board in the US has confirmed that it is sending three investigators to assist in the investigation. 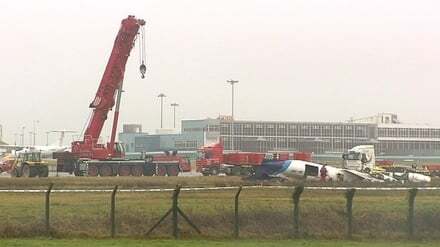 A crane has been assembled on Cork Airport's main runway and work will begin shortly to dismantle the wreckage. Initial indications into what went wrong are likely to emerge in a matter of weeks. However, it is expected that a final report could take more than a year to complete given the serious legal and financial implications of the accident. 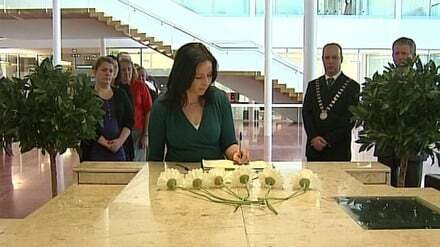 Books of condolence are open at Cork City Hall and Cork County Hall today to allow members of the public express their condolence to the families of the victims of the plane crash. The Chairman of Manx2, Noel Hayes, has said the last 24 hours have been very long dark for him, but even darker and longer for the families of the bereaved. Speaking at a news conference this afternoon, Mr Hayes said his heart goes out to the relatives of the victims. Mr Hayes also offered his best wishes to the injured, who he will visit this evening with the Deputy First Minister of Northern Ireland, Martin McGuinness. The Manx2 chairman will also meet emergency services to thank them for their prompt and sift response to the tragic air accident. He said the aircraft itself had no recent technical issues and underwent a routine maintenance check last week in Spain. When asked by reporters about claims by the co-pilot Andrew Cantle's mother that her son should not have being working yesterday or landing the plane, Mr Hayes replied there is an investigation being carried out and it would be wrong for him to make any comment that would prejudice the investigations findings. Speaking on RTÉ's Morning Ireland, Mr Hayes said he has no reason to believe the aircraft would not have had enough fuel to divert to Knock or Shannon. He said the aircraft was not under pressure to return to Belfast.